Wholly is a complete visualization of the Grail quest database addon as it relates to the player. It shows a panel with quests conveniently separated into zones and indicates their status. Quests can be filtered so only those that need to be completed, etc. appear. Wholly also shows pins on the world map for locations where quest givers appear, and the pins are similarly colored based on their status. Please help with localization if you can. Quests are filtered in a variety of ways including completed, currently in the Blizzard quest log, unobtainable, etc. These display the count of the number of each type of quest in the associated "zone" using the standard quest status colors Wholly uses, summarizing the list at the end with the number of quests displayed and the total number of quests in the "zone". Includes quests that are marked as scenarios. Normally when the world map is open, and the player changes zones, the world map does not update to the new zone. When this is checked, it will update. When this is checked, quests that qualify for Loremaster in a zone are listed even if they start in another zone, and those that are not part of the zone's Loremaster are not shown. When this is checked a LibDataBroker feed is provided that shows the x,y map coordinates of the player's position. Updates Interface in TOC to 80100. Allows map button to work with Titan Location. Adds a little defensive code to avoid a Lua error. Updates Russian localization by dartraiden. 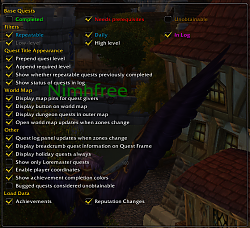 Removes quest level for those quests that have no real level, and changes the display to show variable level maximums as appropriate. Corrects the issue where the map was caused to change unexpectedly. Corrects the problem where TomTom arrows were not being added properly with the new TomTom. Updates Latin American Spanish localization by danvar33. Corrects the problem where some dungeons are not listed. Updates French localization by deathart709 and MongooZz. Updates Russian localization by RChernenko. Updates Spanish localization by neinhalt_77. Made it so we can handle Blizzard removing GetCurrentMapDungeonLevel() and GetCurrentMapAreaID(). Updates Italian localization by luigidirico96. Groups the continents together under a heading. Changes to use for WORLD_QUEST Blizzard's TRACKER_HEADER_WORLD_QUESTS. Disables ability to hide Blizzard map items because Blizzard API has changed. Updates Simplified Chinese localization by dh0000 and Aladdinn. Adds the ability to display prerequisites for Class Hall Missions. Adds support for Allied races. Updates Russian localization from mihaha_xienor. Updates Spanish localization from raquetty. Corrects a timing problem where the notification frame might be sent events before initialized properly. Adds a binding to toggle Loremaster quests. Updates technique to hide flight points on Blizzard map. Adds ability to hide dungeon entrances on Blizzard map. Updates Russian localization from iGreenGO and EragonJKee. Updates German localization from Adrinator and Haipia. Updates the Interface to 70300. Updates the use of PlaySound based on Blizzard's changes based on Gello's post. Updates the Interface to 70200. Adds support for artifact level prerequisites. Updates Spanish (Latin America) localization. Updates French localization by sk8cravis. Updates German localization by RobbyOGK. Updates Spanish (Spain) localization by annthizze. Adds support for Grail's ability to detect withering in NPCs and therefore quest requirements. Adds support for world quests to have their own pin color. Adds ability to show "available" prerequisite used for world quests. Updates German localization by Broesel01. Updates Korean localization by netaras. Adds the ability to control the display of World Quests, including a key binding. Adds a Legion Repuation Changes section. Fixes the problem where the coordinates would cause issues in instances. Fixes the problem where hiding Blizzard map POIs in combat causes Lua errors. Adds the ability to control the display of Blizzard story line quest markers. Updates French translation by coldragon78. Updates Traditional Chinese localization by gaspy10. Adds the ability to control the display of some Blizzard world map icons. Fixes the placement of the Wholly world map button so it appears when the world map is opened. Fixes presenting a window when attempting to load an on-demand addon fails. Changes the ability to display quest rewards without the need for Grail to have the information. Adds the ability to display prerequisites for classes. Updates Spanish (Spain) localization by Ehren_H. Changes the Interface to 70000. Updates German localization by pas06. Adds the ability to filter quests based on PVP. Adds the ability to support Grail's ability to indicate working buildings. Updates Spanish (Spain) localization by ISBILIANS. Corrects the problem where the map location is lost on UI reload. Updates German localization by potsrabe. Adds the ability to filter pet battle quests. Adds the ability to display a quest as a bonus objective, rare mob, treasure or pet battle. Adds the ability to have the quest filter work for NPC tooltips. Updates German localization by Rikade. Updates prerequisite displays to match new Grail features. Adds support to display new group prerequisite information. Corrects the issue where NPC tooltips were not showing drops that start quests. Updates Spanish (Latin America) localization by Moixe. Updates German localization by Mistrahw. Updates Korean localization by mrgyver. Updates Spanish (Spain) localization by Ertziano. Corrects the problem where the drop down button in the Wholly window does not update the follower name properly. Adds the ability to display quest rewards. Splits up zone drop downs that are too large. Adds support to control display of bonus objective, rare mob and treasure quests. Adds Wholly tooltip to the QuestLogPopupDetailFrame. Updates French localization provided by aktaurus. Breaks out the preferences into multiple pages, making the hidden preferences no longer hidden. Adds ability to control the display of legendary quests. Updates Russian localization provided by dartraiden. Changes the Interface to 60200. Adds support for garrison building requirements. Updates German localization provided by DirtyHarryGermany. Updates both Chinese localizations provided by FreedomL10n. Adds the ability to display quests that reward followers. Updates some Korean localization provided by next96. Updates some German localization provided by DirtyHarryGermany. Fixes a problem where Wholly does not load properly when TomTom is not present. Updates Traditional Chinese localizations by machihchung. Updates Portuguese localizations by DMoRiaM. Changes level for pins to display over Blizzard POIs. Changes level for pins so yellow/grey pins display over other colors. Changes default behavior to only show in tooltips faction changes available to the player, with hidden WhollyDatabase preference showsAllFactionReputations to override. Updates various localizations by Nimhfree. Adds hidden WhollyDatabase preference ignoreReputationQuests that controls whether the Reputations section of quests appears in the Wholly panel. Adds hidden WhollyDatabase preference displaysEmptyZones that controls whether map zones where no quests start are displayed. Changes the Interface to 60000. Corrects the Lua error that happens when attempting to tag a quest when no tag exists. Fixes the map icons to look cleaner by Shenj. Updates Russian localizations by vitasikxp. Handles Grail's change in AZ quests to handle pre- and post-063 implementation. Adds the ability to mark quests with arbitrary tags. Updates Russian localizations by dartraiden. Corrects the search function to use the new Grail quest structures. Makes it so quests that are pending or obsolete do not appear when the option indicates unobtainable quests should not appear. Changed display of profession requirements to only show failure as quest prerequisites now show profession requirements consistently. Adds the capability to set the colors for each of the quest types. Changes to use newer way Grail does things. Adds a workaround to supress the panel that appears because of Blizzard's IsDisabledByParentalControls taint issue. Updates Simplified Chinese localizations by dh0000. Fixes the problem where tooltips for map pins were not appearing correctly. Fixes a Lua error with the non-wide Wholly quest panel's drop down menu. Fixes a Lua error when Wholly is used for the first time (or has no saved variables file). Adds a preference to control display of weekly quests (which are not classified as such until Grail 058). Adds a color for weekly quests. Enables quest colors to be stored in player preferences so users can changed them, albeit manually. Fixes the problem where the keybindings or buttons not on the preference panel would not work the first time without the preference panel being opened. Fixes the problem where tooltips that show the currently equipped iLevel cause a Lua error. Adds a preference to control whether tooltips appear in the Blizzard Quest Log. Corrects the problem introdced by Blizzard in their 5.4.0 release when they decided to call API (IsForbidden()) before checking whether it exists. Makes the attached Lightheaded frame work better with the wide panel mode. Corrects a problem where a variable was leaking into the global namespace causing a prerequisite evaluation failure. Attempts to make processing a little quicker by making local references to many Blizzard functions. Fixes the problem where tooltips do not appear in non-English clients properly. Removes the prerequisite population code in favor of API provided by Grail, requiring Grail 054 or later. Updates Chinese localizations by Isjyzjl. Adds the ability to show equipped iLvl prerequisites. Corrects the display problem with OR within AND prerequisites introduced in version 034. Makes opening the preferences work even if Wholly causes the preferences to be opened the first time in a session. Changes the tooltip code to allow for better displaying of longer entries. Adds some Korean localization provided by next96. Changes the Interface to 50300 to support the 5.3.0 Blizzard release. 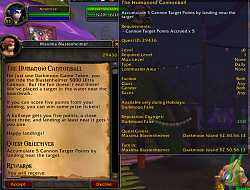 Adds the ability to control the Grail-When loadable addon to record when quests are turned in. Adds the ability to display when quests are turned in, and if the quest can be done more than once, the count of how many times done. Updates support for Grail's new representation of prerequisite information. Adds a hidden default shouldNotRestoreDirectionalArrows that can be present in the WhollyDatabase saved variables to not reinstate directional arrows upon reloading. Adds the ability to show when a quest is obsolete (removed) or pending. Adds support for displaying Q prerequisites and for displaying pet "spells". Changes the technique used to display reputation changes in the tooltip, *** requiring Grail 048 or later ***. Adds support for Grail's new representation of prerequisite information. Fixes a problem where the Achievements were not working properly unless the UI was reloaded. Adds the ability to display NPCs with prerequisites, *** requiring Grail 47 or later ***. Makes the X code prerequisite display with ! [Turned in]. Adds the ability to display phase prerequisite information. Adds some Spanish translations based on input by Davidinmoral. Updates some German localization provided by bigx2. Updates some Russian localization provided by dartraiden. Adds ability to display F code prerequisite information. Changes to use some newly added API Grail provides, *** requiring Grail 45 or later ***. Updates some Spanish localization provided by Davidinmoral. Updates some French localization provided by Noeudtribal. Reputation values that are not to be exceeded now have "< " placed in front of the value name. Allows the key binding for toggling open/close the Wholly panel to work in combat, though this function will need to be rebound once. Fixes a map pin problem with the addon Mapster Enhanced. Changes the faction prerequisites to color green, red or brown depending on whether the prerequisite is met, can be met with increase in reputation or is not obtainable because reputation is too high. Adds support for Grail's new "Other" map area where oddball quests are located. Adds support for Grail's new NPC location flags of created and mailbox. Updates some Portuguese localization provided by marciobruno. Adds Pet Battle achievements newly provided by Grail. Adds support for Grail's T code prerequisites. Adds Simplified Chinese localization provided by Sunteya. Switches to using Blizzard's IGNORED string instead of maintaining a localized version. Adds basic support for putting pins on the Omega Map addon. Changes the display of the requirement for a quest to ever have been completed to be green if true, and not the actual status of the quest. Updates the TOC to support interface 50100. Replaced the calls to Grail:IsQuestInQuestLog() with the status bit mask use since (1) we know whether the quest is in the log from its status, and (2) the call was causing Grail to use a lot of memory. Adds the ability to display requirements for spells that have ever been experienced. Adds the ability to specify amounts above the minimum reputation level as provided in Grail 041 and later. Updates some Traditional Chinese localization provided by machihchung and BNSSNB. Adds the ability to display requirements from groups of quests, both turning in and accepting the quests. Changes spell prerequisite failures to color red vice yellow. Changes preference "Display holiday quests always" to become a "World Events" filter instead, making World Events always shown in their categories. Changes world events titles to be brown (unobtainable) if they are not being celebrated currently. Adds the ability to Ctrl-click any quest in the Wholly quest panel to add waypoints for EVERY quest in the panel. Corrects the incorrect rendering of the wide panel that can happen on some systems. Adds keybindings for toggling display of map pins and quests that need prerequsites, daily quests, repeatable quests, completed, and unobtainable quests. Adds the ability to display maximum reputation requirements that are quest prerequisites. Changes the maximum line count for the tooltip before the second is created, to be able to be overridden by WhollyDatabase.maximumTooltipLines value if it exists. Adds the ability to Ctrl-Shift-click any quest in the Wholly quest panel to toggle whether the quest is ignored. Adds the ability to filter quests that are marked ignored. Adds support for displaying special reputation requirements currently only used in Tillers quests. Adds support to display quest required friendship levels. Fixes the problem where NPC tooltips would not be updated (from changed addon data) upon reloading the UI. Adds support to display prerequisites using Grail's newly added capabilities for OR within AND. Adds support for quests that require lack of spells or spells ever being cast as prerequisites. Adds a filter for Scenario quests. Delays the creation of the dropdown menu until it is absolutely needed to attempt to minimize the taint in Blizzard's code. Fixes an issue where considering bugged quests unobtainable would not filter as unobtainable properly. Adds support for quests that require skills as prerequisites, requiring Grail 038. Updates some Italian localization provided by meygan. Updates from French localization provided by akirra83. Adds support to indicate account-wide quests, starting with Grail 037 use. Corrects the problem where NPC tooltips may not be updated until the world map is shown. Changes how map pins are created so no work is done unless the WorldMapFrame is being shown. Adds the ability to show that quests are Scenario or Legendary. Changes the artwork on the right side of the wide panel. Fixes the problem where the search panel was not attaching itself to the Wholly quest panel. Makes it so Legendary quests appear orange while daily quests that are too high level appear dark blue. Adds two new sort techniques, and also a tooltip for the sort button that describes the active sort technique. Adds the ability to show an abbreviated quest count for each map area in the second scroll area of the wide quest panel, with optional live updates. Fixes the problem where the Wholly world map button can appear above other frames. Makes changing the selection in the first scroll view in the wide version of the Wholly quest panel, remove the selection in the second scroll view, thereby allowing the zone button to properly switch to the current zone. Adds a Wholly quest tooltip for each of the quests in the Blizzard quest log. Updates searching in the wide frame to select the newly sought term. Makes it so Mists of Pandaria reputations can be handled. Makes it so starter Pandarens no longer cause Lua errors. Corrects the problem where removing all TomTom waypoints was not clearing them from Wholly's memory. Corrects locations for Wholly informational frames placed on QuestFrame in MoP beta. Updates the tooltip to better indicate when breadcrumb quests are problems for unobtainable quests. Adds the ability to display profession prerequisites (in the prerequisites section vice its own for the few that need it). Corrects the problem where quests in the log that are no longer obtainable do not appear properly. Adds the ability to show daily quests that are too high for the character as orange. Adds Spanish localization provided by Trisquite. Moves the Daily quests into the Other category. Adds the experimental option to have a wide quest panel. I'd love to be able to have a threshold for the "High Level" quest filter and to still show quests that are, say, 10 levels above me while the "High Level" quests filter is disabled. Or perhaps a macro that allows me to quickly toggle the "High Level" quest filter so I can see what's in store for me when I level up. I can probably add a keybinding to toggle high level quests. Is there a way to turn off Wholly adding colored dots/squares to the minimap? Using carbonite to display quest objectives and this feature is making it hard to actually find them and the quest givers themselves as Wholly is overlaying everything else. There is a preference in Wholly that controls this which should be the first preference in the "World Map" section of Wholly preferences, in English called "Display map pins for quest givers". Note that this only works on the world map (or Carbonite map because Wholly knows how to do this as well), but Wholly does nothing with the normal Blizzard minimap. First of all, reporting the quest that is lacking the proper prerequisite markers (in this case the requirement for skinning profession) would help greatly as Grail can be updated for everyone's benefit. Reporting can be done here, in ticket pages, via email, etc. Wholly by its default parameter settings does not showed what Wholly calls "ignored quests" (long before Blizzard had this). You "tag" a quest to be ignored using the Wholly quest panel. Find the quest of (lack of) interest and Shift-Control-Click the quest. It will be marked as ignored and disappear from view (assuming the normal preference state). To see it again you must set the preferences to see ignored quests, and you can then toggle the ignore off by doing a Shift-Control-Click again. Wholly also expanded on the capability to ignore quests by adding a general "tag" ability which is done using Shift-right-click. This allows you to add your own tags (words) to quests which you can then use to search. So you might mark all the quests that give flowers as rewards or have you fight undead, etc. So I installed grail and wholly and everything work great the best addons I've used so far but for some reason it just stop working nothing coming up on main map even though i can see some quests on mini map when i type in /wholly to get the panel to come up when i check an area where i now i still have say 20 quests to do the panel says I have no quest. I try to set it back to default but the button does nothing all setting are the same even though they are not the default ones. Whats the best way to remove these 2 addons clear any info they may leave behind and try a fresh install. Any help would be great thx in advance. The minimap quest pins are displayed by Blizzard, while the main map pins are displayed by Wholly. If they do not match, most likely Wholly is having a problem. If you bring up the Wholly panel and it is not showing you quests in the zone that you know should be there, most likely the requirements for the quests are not correct in the Grail database. In this case can you tell me what quests you are seeing that are not present in the Wholly panel? You can verify this is what is happening by using Wholly's preferences to show quests that need prerequisites and/or quests that are unobtainable, whose default colors in the Wholly panel are red and brown respectively. Last edited by Nimhfree : 02-24-16 at 09:29 AM. Nimh, you replied to a previous post, that the extraneous (to me) yellow ! on the map are there because faction information (among other things) is needed for Grail to be able to distinguish. What exactly do you mean? Is it that Grail cannot tell if a quest is flagged for Horde or Alliance? Looking up many of the quest names and quest givers I'm seeing, a fair number of them are Horde only - especially the ones that I see with the same name and a different quest giver. Is there some way we can help? I'm also seeing one, sort of to the west of gulrock, for "Bonus Objective: Court of Souls" with a questgiver of Ricky. According to WowHead, Ricky gives a quest called "And the Elekk Too?" which shows on the ! as being given by Sher'khaan. Happy to give help if I can. In simple terms, Grail provides the quest data and Wholly just puts it on the screen. When you accept quests Grail records the NPC target so it can record this information in case Grail has it wrong. This is stored in the Grail.lua saved variables file along with some other data Grail can gather automatically. When quests were being gathered someone had the bonus objective quests given when those NPCs were selected, and this data was integrated into the Grail database when the user's Grail.lua saved variables was sent to me and processed. Therefore, the Grail data for those quests needs to be updated to reflect that the quest is given automatically vice from an NPC. With regard to the specific factions, Grail cannot automatically gather this. And I actually prefer to use the prerequisite system to indicate who can get quests more than the factions. So, for example, quests that do not seem to have any prerequisites will get marked with a faction if appropriate, and then the rest of the quests that rely on those being done will inherit the faction requirement. So there are two major ways to fix the faction issue: (1) just mark each quest as faction specific, and people can help by telling me which ones are found that should be marked, and (2) mark the prerequisite quests for each quest, and people can help by telling me, for example, quest X only became available after finishing quest Y. Over time things will get better, but at the moment I am handling Gorgrond and its differences based on the Lumber Mill/Sparring Arena choice. Talador is still a ways off. :-) The latest data is being released as beta releases on curse.com for now. I had a look at the quest information awhile back and it doesn't have anything that helps identify if it is for one outpost or another or whether it is party of a story quest chain. There is a flag for whether it is a story quest but usually the one that completes the zone story achievement step. For Gorgrond, quests are to the south for the Lumber Mill and to the north for the Sparring Arena. I'm trying to do both types across my toons so I get to know the quests. There are definitely some quests that are common to both but for the most part in those type of zones there is a whole section of quests that are specific. Not all the bonus Objectives in Gorgrond don't disappear. Also there are many yellow Exclamation points all over the map and in Wholly log. All are lvl 92 to 94 and I visited each and every one of them and there is no quest to be found. Is there a way to make it do a server query. I did /grail and it did a server query but nothing changed. EDIT: Now that I did more research, I found out that all these quests are related to the Sparring Arena as I choose the Lumber Mill. Wholly is going to need to know how to distinguish between the Outpost players pick. Ant to not show the quests related to the outpost they don't pick. Wholly should be ok. It is the Grail data that needs to be updated and over time it is being updated to reflect this. Things like specifying faction and prerequisites are what need to be updated the most. If you have specific information to provide for Grail updates, that would be great. Last edited by Saintgabrial : 11-23-14 at 12:48 AM. I have just made a prerelease of Wholly on http://ns1.mithrandir.com/WorldOfWar...erelease.shtml that allows the user to set the colors of the quests through the preferences instead of having to resort to using slash commands. This will make them blue. The 0000FF is the color in RGB that you can find on a website that shows web colors. The first FF should be kept there. which, among other things puts the low-level color back to "FF666666"